Uncle Bunk’s is a specialty food company that is owned and operated by Larry Young, his wife Rose Marie, and their daughter Stacey Young Kasun. Located in Sistersville, WV, Uncle Bunk’s manufactures gourmet products based on old-time Appalachian recipes. There Really is an Uncle Bunk! Larry grew up in Wetzel County, WV, right outside Wileyville on Postelwhait Ridge. He is the youngest of five with four older sisters, so he was named after his father Lawrence Richard Young. Instead of Junior he was somehow christened with the nickname BUNK when he was very young. No one called him Larry or even Lawrence until he met his wife, Rose Marie. On the farm, Bunk learned to garden and to can everything! He was taught just as his sisters were to make all of the family favorites. Gardening and canning became his hobby when he moved to Sistersville where he worked for Union Carbide and along with Rose Marie raised their two daughters, Stacey and Kristina. After he retired his nieces and nephews - especially his niece Connie Wells, encouraged him to sell the products he canned. Because "Uncle Bunk's canned stuff was just so good!" 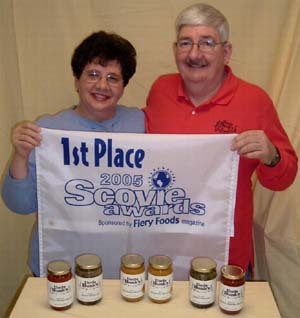 she encouraged him to enter the Amateur Scovie Awards held in Albuquerque, New Mexico and sponsored by Fiery Food and Barbecue Magazine. He entered and won GRAND PRIZE for his Mustard Relish and his Rustic Pepper Sauce placed Third.